Mallory Marshall joined the Samford faculty in 2014 after completing a PhD in Exercise Physiology at Michigan State University. She studies the physical activity behaviors of pregnant and postpartum women using various physical activity monitors, and is particularly interested in walking behavior and how daily steps and stepping rates change as pregnancy progresses. She is also interested in the role of physical activity during pregnancy on offspring growth and health, as well as social support related to physical activity during pregnancy. She spends much of her time teaching and mentoring undergraduate students through the research process as they take a required series of courses designed to facilitate completion of an IRB-approved research project from design to analysis to formal presentation. 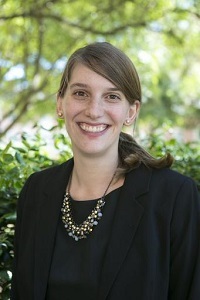 She believes that the research process is a valuable tool to teach students to defend their decisions with data and research, and loves to help students see the parallels between research and the Christian life, where believers make decisions based upon the truths found in Scripture. Marshall, M. R., Paneth, N., Gerlach, J. A., Mudd, L. M., Biery, L., Ferguson, D. P., & Pivarnik, J. M. (2018). Differential methylation of insulin-like growth factor 2 in offspring of physically active pregnant women. Journal of developmental origins of health and disease, 1-8. Conway, M. R., Marshall, M. R., Schlaff, R. A., Pfeiffer, K. A., & Pivarnik, J. M. (2017). Physical Activity Device Reliability and Validity during Pregnancy and Postpartum. Medicine and science in sports and exercise, 50(3): 617-623. Pivarnik, J. M., Connolly, C. P., Marshall, M. R., & Schlaff, R. A. (2017). Can Pregnancy be an Ergogenic Aid to Athletic Performance? : A Review. Women in Sport and Physical Activity Journal, 25(2), 111-117. Marshall, M. R., & Pivarnik, J. M. (2015). Perceived Exertion of Physical Activity During Pregnancy. Journal of Physical Activity and Health, 12(7), 1039-1043. Marshall, M. R., Coe, D. P., & Pivarnik, J. M. (2014). Development of a Prediction Model to Predict VO2peak in Adolescent Girls Using the Bruce Protocol to Exhaustion. Research quarterly for exercise and sport, 85(2), 251-256. Marshall MR, Rogers RR. Assessment of undergraduate research curriculum in kinesiology. Roundtable presentation at the American Kinesiology Association Annual Workshop, Denver CO, 2018. Marshall MR, Montoye AHK, George AJ. Pregnancy walking cadence does not vary by trimester. Poster presentation for the American College of Sports Medicine Annual Meeting, Minneapolis MN, 2018. Marshall MR, Hammond K, Watts C, Ellis C, Gray B, Stallings E, Petrella JK. Pregnancy physical activity attitudes and beliefs in a non-pregnant population. Poster presentation for the American College of Sports Medicine Annual Meeting, Denver CO, 2017.